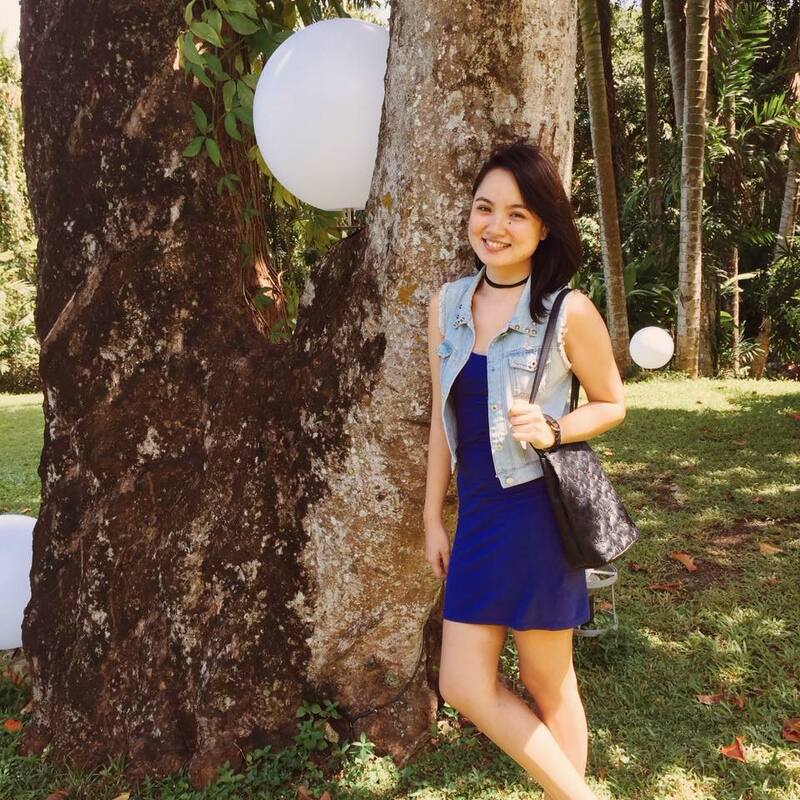 Today, we feature Denise Esteves – graphic designer, everyone's ray of sunshine and a strong advocate of pet adoption. Stray cats are a norm at the office where Denise works. People pass them by every day. Sometimes they pause to give a bit of food or to pet them, but for the most part, they're left unnoticed. But for Denise, right from her very first encounter, it was different. "I immediately fell in love with her sky blue eyes." She's talking about one of the more longer-staying tenants of the place who she later aptly named Kitty-chan. On that day, she saw that Kitty-chan was so thin and so she decided to give her food. That one moment started what eventually turned out to be a daily routine between the two. "I would share my lunch with her every day or I'd buy her own food. Until finally she would let me pet her." It's a scene reminiscent of the beloved little prince and his rose, of time invested in nurturing a relationship that transforms one into a unique, priceless friend. Time passed with the same rhythm between Denise and her newly-tamed pet until the inevitable happened with most stray cats – Kitty-chan got pregnant. "When I found out that Kitty-chan was pregnant, I wanted to make sure that she and her kittens would have a home, and that someone would take care of them," Denise shares. And so her mission to build a DIY cat house and to look for possible pet parents started. For the next few days, people at Denise's work would see this petite girl going around the building, obviously looking for something. The next thing they knew, the same girl's lifting big empty boxes, holding rugs, a roll of masking tape and a pair of scissors, and hanging around the corner where the stray cat is usually at. 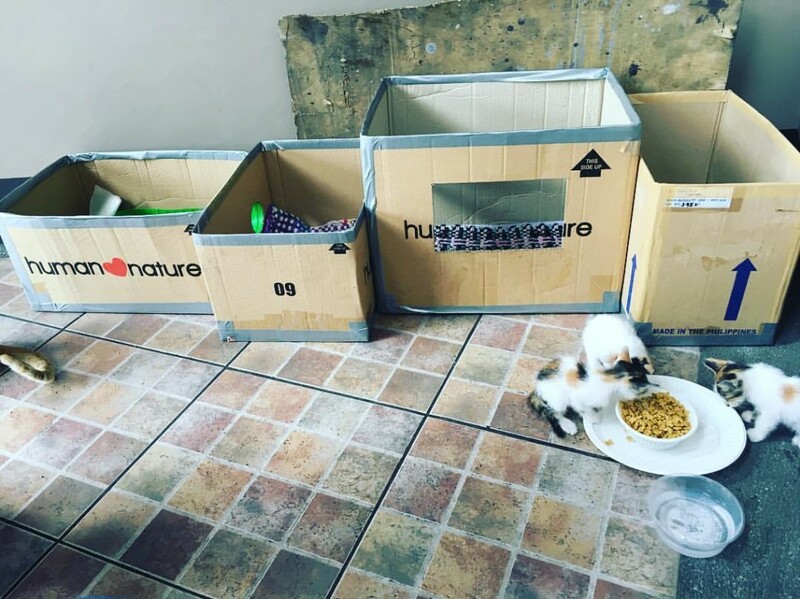 Then one day, they finally see it: a sturdy cat house made out of used boxes, fully furnished with comfy rugs, and even one bowl for cat food and another for water. Kitty-chan finally has a home! So amused by the sight, some of Denise's teammates dubbed her little project as "GK", short for Gawad Kitty-chan. It's a play on Gawad Kalinga, a non-profit organization popularly known for building houses for communities in need. If you're wondering where the cat food is from, yes, it comes from Denise's own pocket money. Soon enough, she inspired fellow cat-loving officemates to pitch in for the food, and hopefully in the future, for Kitty-chan's spay fees as well. 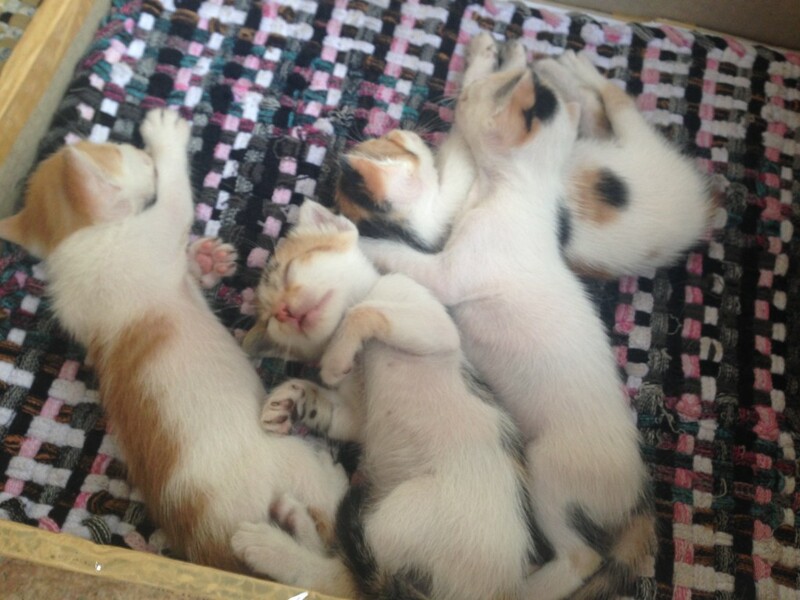 Soon enough, Kitty-chan gave birth to four cute kittens. 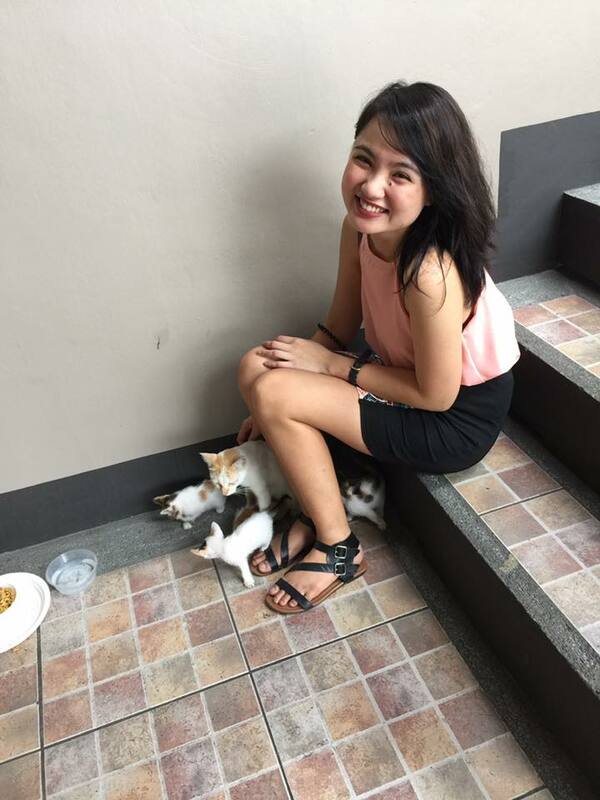 Though she wanted to so bad, Denise couldn't take them home seeing as she already has three cats (all "pusang Pinoy", all either adopted or rescued). "So the next best thing I could do is look for loving homes that will take care of them fur-ever," says Denise. Pet adoption is a strong advocacy for Denise, seeing it as a more pro-life practice than simply buying from pet shops that usually get from puppy and kitten mills. 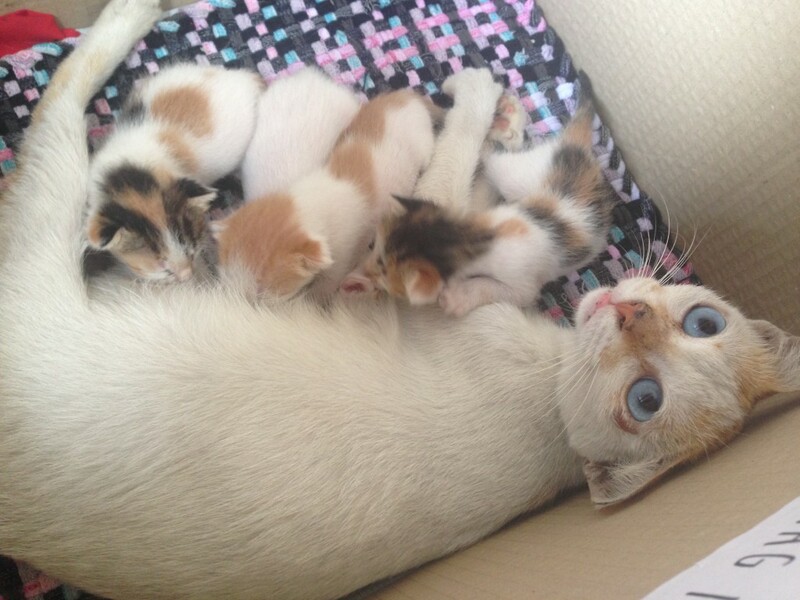 Kitty-chan's babies. As of writing this article, three of the four have already been adopted. Denise hopes Kitty-chan herself will be adopted as well. "We have an abundance of strays," further explains Denise. "Everywhere you look, there are stray cats and dogs with no one to look after them. Some even get hurt. And those in pounds get killed when no one claims or adopts them. Why not make life better for everyone by adopting?" Thank you, Denise, for sharing your light in your own simple ways. Thank you for being kind, nurturing, courageous and beautiful. If you're planning to adopt a pet, you can start with non-profit organizations PAWS Philippines and CARA. Note: Part of the interview was done in Filipino and has been translated to English.